Celebrity social media publishing platform WhoSay has released an iOS app aimed at connecting fans with its members. WhoSay has been steadily gathering some of the biggest influencers, including Eva Longoria, Novak Djokovic, Tom Hanks, Sofia Vergara and CeeLo Green, as clients of its publishing tool. Its 1,500 celebrity members have a reach of 1 billion connections across social media. The company’s product has up until now been celebrity-facing. The company’s pre-existing Talent app allows influencers to publish content to a range of social networks and is one of the few third-party apps with permission to post directly to Instagram. The new fan app opens up the next step in WhoSay’s strategy by creating a digital magazine sourced from its members’ posts. 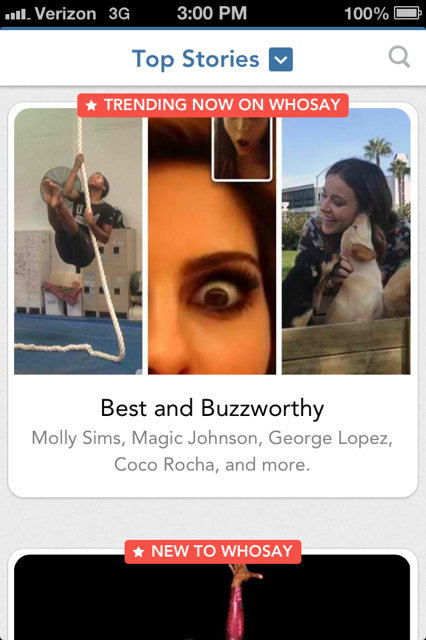 Users can select artists and personalities to follow or browse WhoSay’s curated content. WhoSay CEO and co-founder Steve Ellis created the company three years ago with the help of Hollywood talent agency CAA. The startup is setting out to create a media business that celebrities themselves have full control over. As its clients publish to social media, they effectively preempt paparazzi, gossip magazines and tabloids by telling their own story. Ellis called the app the “first entertainment magazine created by entertainers themselves.” A portion of the revenue generated from the fan app and the accompanying Web version will be shared with its members. WhoSay isn’t planning on turning its fan base into its own social network, as it will continue to provide services to allow clients to post wherever they want. “All we want to do is give this a richer contextual editorial mix,” Ellis noted, adding that WhoSay isn’t competing with other social celebrity platforms. WhoSay is attracting 12 million visitors a month to its properties and has 2 million registered users.